We’d love your help. Let us know what’s wrong with this preview of Creativity by Mihaly Csikszentmihalyi. To ask other readers questions about Creativity, please sign up. Is there a hardcover version of this in English? Mike Morris Yes. I got an english hardcover from my local library. This was a good if not a great book. Its greatest strength lies in the thesis introduced early on and supported throughout that the kind of creativity that leaves a trace in the cultural matrix rests not in the personal creativity of the individual, but in what Csikszentmihalyi tags the “systems approach “ to creativity. To have any effect, a creative idea must be couched in terms that are understandable to others, pass muster with the experts in the field (i.e. the gatekeepers to the domain), a This was a good if not a great book. Its greatest strength lies in the thesis introduced early on and supported throughout that the kind of creativity that leaves a trace in the cultural matrix rests not in the personal creativity of the individual, but in what Csikszentmihalyi tags the “systems approach “ to creativity. To have any effect, a creative idea must be couched in terms that are understandable to others, pass muster with the experts in the field (i.e. the gatekeepers to the domain), and be included within the cultural domain (the set of symbolic rules or procedures) to which it belongs. In this systems view, the definition of a creative person is someone whose thoughts or actions change a domain or establish a new domain (pp. 27-28). This is no easy task, especially since he or she needs to learn the existing domain or domains first, and almost always necessitates being in the right place at the right time (e.g. studying quantum physics at the beginning of the 20th century or women seeking academic opportunities when WWII broke out). Having established this in the first 30 pages, if you didn’t read the remaining 350 you wouldn’t miss much. But I still enjoyed reading the stories and thoughts of selected individuals whom the author deemed as “creative” according to the definition above (However, I disagreed with the selection of a few of these and would have chosen at least one more person of faith in addition to the Quaker who was briefly highlighted. Also on the issue of faith, I found the author's grouping on page 371 of studying the bible with addictive behaviors such as cruising the internet and betting on horse races to be rather laughable!). 1. Those who persevere and succeed must be creative not only in their manipulation of symbols but maybe even more in shaping a career and a future for themselves that will enable them to survive while continuing to explore the strange universe in which they live (p. 199). The final section deals with how to enhance personal creativity. Some of these ideas were helpful (e.g. to seek to be surprised and to seek to surprise another person at least once every day, to seek to look at problems from multiple perspectives instead of assuming you see the issue clearly from one perspective, etc.) but others just seem to be taking up space on the page. I’m afraid the phraseology of how to use psychic energy more effectively on page 356 and a few other places lost my interest almost completely. Csikszentmihalyi considers interdisciplinary environmentalist Barry Commoner, heroic polio vaccine discoverer Jonas Salk, young adult fantasy author Madeleine L’Engle, prolific biologist E. O. Wilson, Great Books editor Mortimer Adler, the late muckraking journalist Jack Anderson, physicist and inventor Freeman Dyson, Nobel prize-winning chemist Linus Pauling, and jazz pianist and composer extraordinaire Oscar Peterson (among others). These interviews provide plenty of insightful moments for the one who struggles through the roughly 600 pages of the text’s body (it is supplemented by an appendix with biographical information on the interviewees and an appendix which delineates the interview protocol used in the study (though the author admits that he didn’t follow the script by rote because he didn’t want to insult brilliant and creative people with whom he had great respect and, because of their heavy work schedules, less time than is available in some studies). One of the myths that is busted is the idea that one must have a privileged childhood in order to learn and experiment enough to be truly creative (p. 35 and especially, p. 446). While that may have some modicum of truth in it, there is also the fact that many people attribute their creativity to having had to go through devastating, sometimes tragic times. Csikszentmihalyi presents both sides in Creativity as he observes, “Creative individuals are remarkable for their ability to adapt to almost any situation and to make do with whatever is at hand to reach their goals.” (p. 143) Certainly, being born into a wealthy or sophisticated family offers a certain amount of what sociologist Pierre Bourdieu calls “cultural capital,” but some individuals “fight” their way to the right schools and opportunities while more privileged peers stay behind (p. 149). To be honest, this was a chapter that I personally needed to read because I have often believed that I could have been more influential if I had been born with more “cultural capital.” Now, I just rejoice that I managed to get as far as I did (and it’s, of course, debatable how far that is). Another myth that is busted would be the perpetually energized and vital creative individual. Actually, Creativity suggests that creative individuals are those with “…the ability to move from one extreme to the other as the occasion requires.” (p. 159) There does seem to be a great deal of physical energy involved, but the complexity of their personality balances that with times of quiet and rest. As for insights (some of which I had seen in other sources), I liked one of the respondents’ definition of creativity as consisting of anticipation and commitment (p. 213). I also liked the suggestion that the creative process usually takes five steps (although they may overlap): 1) period of preparation or immersion in the subject (pp. 218-219), 2) period of incubation (p. 219), 3) breakthrough of insight (the “Aha” or “Eureka” moment) (pp. 219-220), 4) evaluation as to whether the insight is worth pursuing (p. 220), and 5) elaboration (Thomas Edison’s “99 percent perspiration.”—p. 221). Or, maybe one should take away the wise words of Madeleine L’Engle: “Human beings are the only creatures who are allowed to fail. If an ant fails, it’s dead. But we’re allowed to learn from our mistakes and from our failures.” (p. 663) That’s one of the biggest takeaways from this book for me. This review has been hidden because it contains spoilers. To view it, click here. This is a good book about creativity. He cites that creativity needs to be in a specific domain, vetted by specific people in a particular field, and of course it needs to be someone who is "creative." Creativity is important b/c most of the things that are interesting, important, and human are the result of creativity and creativity allows us to live a fuller life. Creativity is the act of imposing our desires on reality. Mihaly describes the creative process as having 3 elements: 1) a culture t This is a good book about creativity. He cites that creativity needs to be in a specific domain, vetted by specific people in a particular field, and of course it needs to be someone who is "creative." Creativity is important b/c most of the things that are interesting, important, and human are the result of creativity and creativity allows us to live a fuller life. Creativity is the act of imposing our desires on reality. Mihaly describes the creative process as having 3 elements: 1) a culture that contains symbolic rules 2) a person who brings novelty into the symbolic domain 3) as field of experts who recognize and validate the innovation. He likens creativity to evolutionary change in which random mutations get transmitted if it makes the individual and thus the gene pool more advantageous. Creative people act on memes and if enough people see value in them, then the creative product becomes part of the culture. Creative products are built from what is known in the past. It takes effort to change tradition b/c rules of a meme must be learned before it can be changed. Wealth is a prerequisite for people who look to think creatively since attention has to focus on things other than survival and specialization can be readily had in city. Also centers of creative activity tend to be at the intersection of different cultures, where beliefs, lifestyle, and knowledge mingle and allow individuals to see new combinations of ideas with greater ease. Creative types are seen as selfish and ruthless b/c of the single-minded pursuit of their goals that lead them to flow. Studying creativity is important since its results enrich the culture and so they indirectly improve the quality of all our lives. We may also learn how to make our lives more interesting and productive. All of us have need for security and expansive excitement. Creative types focus on risk and expansion of self. Mihaly has biased skewed to people who are happy with their lives and have the benefit of positive hindsight of 60 yrs Olds who have made it. Creativity happens b/w a person's thoughts and a socio-cultural context. Creative individuals can be people who are interesting and stimulating with unusual thoughts, or people who experience the world in novel and original ways. These people are fresh, insightful, and make discoveries they alone know how to make. Finally, there are creative people who have changed the culture in some important respect. He focuses on people who impact the world/culture. In Mihaly definition of a creative person, is someone whose thoughts or actions change a domain or create a new domain. It was wealth and uncertainty that made Florence dedicate themselves to being the "new Athens" of the arts. It was the people prioritizing the Arts that led Florence to be the artist capital. Support and competition forced artist to outperform each other. Creativity are properties of systems rather than of individuals. Creativity needs conducive environments to thrive. A person skills need to match the environment where they live to thrive. Creativity is the convergence of individual skill, luck, and an environment conducive towards creativity in that specific domain. A creative individual must learn the rules of a domain before one be innovate in that domain. They must be very good @ whatever skill they are trying to foster then one can play and innovate within that specific domain. After the creative person must be able to discriminate b/w a good idea and a bad idea. While productivity is the only thing that ensures creativity, Mihaly says a genetic predisposition in specific domain facilitates the creative process. A genetic predisposition allows the person a greater early interest in a specific domain that allows a good dose of curiosity, wonder, and interest in that domain. Openness to experience, a fluid attention that constantly process events in the environment, is a great advantage for recognizing potential novelty. Curiosity and love for the subject is a must in the creative process. Luck comes into play in having access to a specific domain thus richer children are better off than others b/c they have access to more domains. Also connections in a specific field is need for the world to take notice of once talents/creative potential. Connections in a specific field can only be had through random connections or networking. 1) They have great physical energy but also often quiet and @ rest. They control their activities. A period of focused concentration interchanges with a period of rest is important for their creativity. They have a high libido mixed with a period of celibacy. 2) Creative individuals tend to be smart and naive at the same time. After an IQ of 120, IQ and creativity do not have a high correlation. Someone who is a genius might get complacent and not have the necessary curiosity to do creative work. People who bring acceptable change in a given domain bring both convergent and divergent ways of thinking. While divergent ideas are necessary in generating ideas, convergent thinking is necessary in using good judgment in seeing which ideas are worth pursuing and which ones are a waste of time. 3) They are both playful and discipline in approaching a task. While playfulness is easy enough to understand in playful individuals, discipline takes the form of seeing the project through in a timeless fashion. realities in the present. The novelty they see is rooted in reality. Banking like science is an evolutionary process in that nothing changed but the perception. 5) Creative people are both extroverted and introverted simultaneously. Extrovertion is needed for crosspollination of idea while introversion is needed to master the skills of a specific domain. 6) Creative individuals are proud and humble @ the same time. They look to future accomplishment instead o dwelling on the past. They focus on family @ the same time their achievement gives them a self-assurance that they can accomplish more. They are both ambitious and selfless. While ambition is necessary to accomplish big things, selflessness is needed to accomplish a goal without the ego being involved. 7) They tend to be psychologically androgynous. 8) They tend to start from a traditional and conservative base and later become rebellious/iconoclastic (Pope Francis). 9) They are both passionate and objective about their work. To be passionate is necessary in the creative process while being objective is necessary in order to separate good ideas from bad ones. 10) Openness and sensitivity exposes them to great pain and enjoyment. They enjoy the creative process for its own sake without any external rewards. Conflicting traits are important for creative types b/c one has to be both able to change a system while being part of the system. often dissatisfaction with the rigidity of domains that makes great creative advances possible but this presupposes familiarity with a specific domain. One cannot transform a domain unless one first thoroughly understand how it works. One cannot be creative without becoming dissatisfied with that knowledge and rejecting it for a better way. Also, stimulation by colleagues or some sort of public need can create a tension that starts the creative process. Discovered problems are superior to presented or "pre-formed"problems in changing a specific domain. 2) The idea is incubated below the threshold of consciousness being churned around. It is during this time that unusual connections from the norm are found. People who keep themselves occupied all the time are generally not creative. Despite the subconscious nature of the incubation period, the foundation is still built upon a specific domain. 3) Insight to the problem is then found. It occurs when the subconscious connections b/w ideas fits so well that it is forced to pop out into awareness. 4) evaluation whether the insight is worth pursuing. Although creative individuals differ in their personality, they are united in the fact that they are passionate about the work they do and would do it even if they were not paid. Creative people describe what they like most about their work the process of "designing or discovering something new." While the vast majority of people are conservative in conserving their energy, we also feel a dopamine high from discovering new things. Enjoyment consists of flow the feeling when things are going well as an almost automatic, effortless, yet highly focused state of consiousness. 4) action and awareness are merged - our concentration is focused on what we are doing. 7) self-consciousness disappears - we feel "one with the universe" yet after the event we feel stronger sense of self. A scientist or a writer has to internalize the feedback mechanism so they know if their work is good or not. What they felt fortunate about was that they could get paid for something they had such fun doing and that in the bargain they could feel that what they did might help the human condition along. The link b/w flow and happiness depends on whether the flow producing activity is complex, whether it leads to new challenges and hence to personal as well as cultural growth. Creative individuals tend to gravitate toward centers of vital activity, where their work has a chance if succeeding. The great centers of learning and commerce are such places. The place where one lives is important for 3 main reasons: 1) one must be in a position to access the domain in which one plans to work. Domains are clumped into specific areas. 2) novel stimulation is not evenly distributed. Certain environments have a greater density of interaction and provide more excitement and a greater effervescence of ideas; therefore, they prompt the person who is already inclined to break away from convention to experiment with novelty more readily than if he had stayed in a more conservative, more repressive setting. Science have certain hot spots where people congregate. Texas oil was able to make UT a first rate public institution. But being in the nexus of your domain also means one has to perform or perish. connections among ideas below the threshold of conscious intentionally. Life-threatening situation also has the same effect as beautiful natural surroundings to stimulate creative thinking. For the day-to-day work, the macroenvironment needs to be a crossroad of culture, where information from different traditions are exchanged and synthesized. Microenvironments needs to make the individual comfortable and in control. A home needs to have personal touch to be comfortable for a creative person to do their job. "What helps to preserve and develop individuality, and hence creativity, is an environment that we have built to reflect ourselves, where it is easy to forget the outside world and concentrate completely on the task at hand." Creative types impose their own routine and stick by it outside external time constraints. They have to master their environment and their own time. Whereas in preparation, evaluation, and elaboration a stable routine environment is preferable, the incubation and epiphany moments need to be in a novel beautiful setting that allows one a creative process. The only consistent theme of creative geniuses in early childhood is "a more than usually keen curiosity about one's surroundings." "Practically every individual who has made a novel contribution to a domain remembers feeling awe about the mysteries of life..." Initial childhood interest in a specific domain, gets reinforced by adult adulation for that specific skill. If a child has a competitive advantage in relation to other children in a specific domain then he is more likely to pursue it. It seems the only thing that is hereditary is musical and mathematics skills. Parental influence in shaping a creative individual domain of choice. Parents should maximize exposure to the greatest opportunity possible. Also to minimize sibling rivalry each child should be good @ something that the other is only ok in. Parental influence becomes more important the more disadvantage the child is especially setting moral and intellectual standards to live by. Parents were most influential in shaping a person's character especially honesty. Honesty is important to have long-term success in a specific domain. Extreme home environments seem to stimulate creativity from being orphaned to being raised in a loving family. Also there is a disproportionate percentage of people who came from upper middle class and lower middle class who become creative but not from thr vast American middle class. 30% of creative children who made an impact in their specific domain come from lower middle class but the family never identified with their lower class position but instead had high aspirations for their children's academic achievement. 60% of creative individuals that impact their domain come from the professional classes. A successful individual remembers their past with warmth so the past is consistent with the present. What matters more for people is their subjective interpretation of an objective past not what actually happened. Great teachers stimulate a child curiosity in a given study. The teacher influence creative by noticing the student, believed in his ability, and cared. Furthermore, the teacher showed care by giving the child extra work to do, greater challenges than the rest of the class. Popularity makes kids want to conform instead of developing their unique talents. "Nostalgia for the teenage years is almost entirely absent. Marginality---the feeling of being on the outside, of being different, of observing with detachment the strange rituals of one's peers---was a common theme." The common denominator to creative-types in relation to their early years is that instead of being shaped by events, they shaped events to suit their purposes. For many creative professional, college was the high point in their lives when they found their voice and their vocation became clear. While they had come from small provincial settings where they felt odd and disoriented, college provided place where people found their uniqueness. yang that need to be combined in order to achieve something new." While curiosity is playful and deals with objects for its own sake, drive is competitive and achievementoriented. Luck plays a role being in the right place at the right time meeting with the right people. The individuals had stable satisfying marital relationships. While sexual drive certainly fuels the creative process, the majority conformed to a more sedate sexual pattern. Perhaps due to the age of the respondents, the majority mentioned family and children as part of their greatest accomplishments. Spouse is key to accomplish what creative want to accomplish. Stability in family life is key if one wants to fight external demons. Women also have to be supported to thrive in their careers. Sometime being married to an equally ambitious woman can strain family life. Creative individuals are aware that a lasting, exclusive relationship is the best safeguard of that peace of mind they need in order to focus on their creative pursuits. Most creative achievements are part of long-term commitments to a domain of interest. Creative individuals are forced to invent jobs they will be doing all through their lives. Creative individuals don't have careers; they create theIr own path. For example, Yalow parlayed her physics degree into founding the field of nuclear medicine. Creative career path is similar in that " a new way of doing things is discovered b/c the person is always open to new learning and has the drive to carry through the new idea that emerges from the learning. I believe this is a seminal book for anyone interested in the psychology of the creative process. I first read Creativity in 1998-1999 and enjoyed it then, but recently picked it up again to take on a trip with me. This time, some 11 years later and after a major career change, the books means so much more to me. I think that is because the first time I read it, I was looking for ways to bring more creativity into my life. Now, after a few years of focusing on art as my career, the content deepl I believe this is a seminal book for anyone interested in the psychology of the creative process. I first read Creativity in 1998-1999 and enjoyed it then, but recently picked it up again to take on a trip with me. This time, some 11 years later and after a major career change, the books means so much more to me. I think that is because the first time I read it, I was looking for ways to bring more creativity into my life. Now, after a few years of focusing on art as my career, the content deeply resonates with me: I really understand what Csikszentmihalyi is describing (through his words and through the words of the interviewees that led him to his conclusions). Right now I am at the Helsinki airport and have a long day of flying ahead of me, and look forward to digging in again to the discourse with hours to sink into it. I can hardly wait to get back to my routine of creating and observing anew what Csikszentmihalyi has described as the process, and with a new consciousness, seeing if I can use my newly clarified understanding of the process to further it. I think this is a seminal book for anyone interested in the psychology of the creative process. That being said, I believe there is a bit of contradiction in his introductory chapters regarding context in which he defines creativity as what is accepted by experts in a given field (among other defining criteria)--and later describes many situations in which the artists' (or other creatives) own assessment of the work as being the ultimate test. While it may be that he was, in this latter part of the discourse, referring to one specific type of creativity he defined in the introduction, he doesn't make that clear and thusly it seems contradictory. I am sure this book could have been way longer, for it is a complex subject and apparently he had quite a lot of meat from the substantial number of interviews conducted; it may be that to condense it to a length readable by the general public, he glossed over that inconsistency. Mihaly's book "Flow" told us that the way to happiness involves mindful challenges. The author studied creative people, and tells us what he found. But more importantly for the reader, he gives us his ideas for making our lives as creative as his interviewees. For Mihaly's book "Flow" told us that the way to happiness involves mindful challenges. "Divergent thinking is often perceived as deviant by the majority, and so the creative person may feel isolated and misunderstood." Some of the creative people interviewed for the book include Hans Bethe, Freeman Dyson, Stephen J. Gould, Eugene McCarthy, Linus Pauling, Jonas Salk, and Benjamin Spock. So Go Forth and Create! If and when I begin my Oprah-esque empire, in addition to constantly touting Fizzy Lizzy's (best drink ever!!!) I will also employ this brilliant man as my guru. Fortunately for my fan base, this man is an actually intellectual who has devoted himself to the study of psychology and not some quack that believes if you just imagine that you have a refrigerator with a DVD player, one will materialize. Also, Csikszentmihali never did a match.com commercial. The book describes the character traits of 'creative' people, and tries to extrapolate common character traits and habits of creative individuals. Some of the 'creative' individuals interviewed are leading pioneers in their field, these include several Nobel laureate scientists. The author discusses creativity in the context of 'flow', the state where we become one with the process of creation. The book is structured so that there are actual interview snippets of creative individuals interspersed The book describes the character traits of 'creative' people, and tries to extrapolate common character traits and habits of creative individuals. Some of the 'creative' individuals interviewed are leading pioneers in their field, these include several Nobel laureate scientists. The book is structured so that there are actual interview snippets of creative individuals interspersed with the author's findings and theories about creativity. The book uses these interviews to dispel the myth of the 'creative genius', the myth being that creativity is a gift from above,not something the individual can cultivate. The author proposes that while individual talent plays a role, the convergence of talent,luck,hard work and more importantly, being born at the right time and place in history is necessary for the creative individual to bring those talents to fruition and make a meaningful contribution. And the message being, while we cannot change the circumstances, if we develop our talents, then ,we will be ready to make the most of a favorable circumstance,when it does reveal itself. The other important theme running through the book is that creativity is worth pursuing as a goal in itself, even if it never brings fame and fortune. While we are creating, be it a piece of art, a musical score or a mathematical model of something, if the challenge at hand matches our level of skill, then we enter a state of 'flow', and that in itself justifies our effort. This is what makes the pursuit of skill in a domain(art,music,math) so important, because it enables us to create and enter 'flow' states. Without this capacity, 'leisure' is usually consumed by dark,anxious thoughts that makes people reach out for passive sources of entertainment. The book is a very good follow up read to the author's classic work 'Flow and the psychology of optimal experience'. Наверное, это самое полное и достоверное исследование природы креативности из всех, которые можно найти. Автор излагает материал структуровано, без "воды" и с множеством ссылок на релевантные исследования и литературу. Одна из тех научных книг, читать которую вообще не скучно, а едва добравшись до середины, уже хочется перечитывать. The book is a thorough study of creative individuals. The author, renowned psychologist Mihaly Csikszentmihalyi, set out to interview scientists, inventors and artists who have made a major contribution to humanity by either changing a domain or creating a new one. He wanted to understand creativity on the larger scale and he succeeded in gathering some extremely interesting material about the lives of these individuals. The author’s conclusion is that creative people have complex personalities. They contain contradictory extremes-instead of being an individual they are a multitude. They can be aggressive and cooperative either at the same time or at different times depending on the situation. Creative people are able to express the full range of traits that are potentially present in the human repertoire but usually atrophy because we think that one or the other pole is good, whereas the other extreme is bad. Basically, creative people are "shape shifters" and can move from one extreme to the other as the occasion requires and that, without any inner conflict. Creative people express psychological androgyny: they have the ability to be at the same time dominant and submissive aggressive and nurturant, sensitive and rigid, regardless of their gender thus doubling their repertoire of responses and as a result of that they interact with the world in a richer way. I enjoyed this book enormously and I recommend it to all, especially chapters 3 (The Creative Personality) and Chapter 14 (Cultivating Flow in Everyday Life). The overall message is that creativity is a way for us to find purpose and enjoyment in the chaos of existence; that creativity makes life interesting and fulfilling. And most importantly, that we all have the potential psychic energy that we need to live a creative life on a personal level. 1. Try to be surprised by something every day or notice something creative done by someone else. 2. Try to surprise at least one person by saying or doing something that you don’t usually do or allow yourself to do. 3. Keep a diary in which you write down each day what surprised you and how you surprised others. 4. When something strikes a spark of interest, follow it. Don’t censor. Don’t limit yourself to what you think is possible or reasonable. 1. Wake up in the morning with a specific goal to look foreword to – believe that there is something meaningful to be accomplished each day. Before going to sleep visualise the next day’s task that compared to the rest of the day is relatively interesting and exciting. 2. Take charge of your schedule as much as possible. 3. Make time for reflection and relaxation. 4. Shape your space, harmonize yourself with your surroundings as much as possible. Again, this book is a must read, especially chapters 3 and 14. 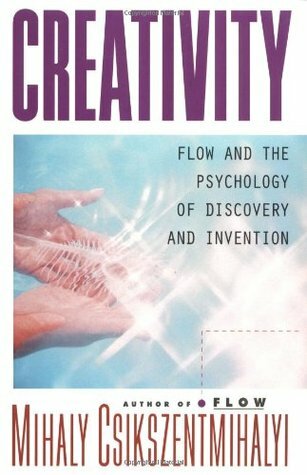 With a name that will always be associated with the concept of 'flow', Mihaly Csiksgentmihalyi was a likely choice for a book giving a scientific view of creativity. The way this has been achieved is primarily to identify a large number of people that Csiksgentmihalyi considered highly creative and to ask them if they will be interviewed. There are a number of problems with this approach - would Einstein have said yes, for instance? But there is no doubt that the popular psychologist is able to With a name that will always be associated with the concept of 'flow', Mihaly Csiksgentmihalyi was a likely choice for a book giving a scientific view of creativity. The way this has been achieved is primarily to identify a large number of people that Csiksgentmihalyi considered highly creative and to ask them if they will be interviewed. There are a number of problems with this approach - would Einstein have said yes, for instance? But there is no doubt that the popular psychologist is able to winkle out a few interesting thoughts on the matter. We are first introduced the the creative process, through a little bit about the nature of creativity, the creativity personality, how they go about the creative act and the inevitable link in with the concept of 'flow'. Perhaps the most interesting thing in this section is the suggestion that creativity can never be solely about the creative individual. Csiksgentmihalyi tells us that we need three components: an existing domain - an area of knowledge that that the creative individual knows, the act by the individual, which often involves coming at some aspect of the domain in a novel way, and the field, which are the creative person's peers. Csiksgentmihalyi's argument is that without the field's recognition, the creativity isn't 'real'. So, for instance, he suggests that Bach's work only became creative once it was recognised as great after a couple of centuries of being dismissed. The next part of the book takes us through the creative lives of his interviewees. I find this kind of thing somewhat tedious to read, as it doesn't really add much to the discussion. We then move on to 'domains of creativity', looking for differences and similarities between, for instance, the 'domain of the word' and 'the domain of life'. This, frankly, was also fairly hard work with little concrete scientific analysis provided. A final section, protestingly (as Csiksgentmihalyi doesn't want this to be a self-improvement book particularly) adds ways to enhance personal creativity. Although what's here isn't bad, it tries hard to ignore most of the work that has been done on enhancing creativity, so skirts around the kind of techniques espoused by the likes of de Bono and Osborn without really acknowledging them, which is a shame and makes it relatively weak in practical terms. "This book which attempts to bring together 30 years of research on how creative people live and work is an effort to make more understandable the mysterious process by which men and women come up with new ideas and new things." What makes people creative? that's his question that he wants to answer. And at the same time he wants creativity that makes the change. He is looking at it from the psychology side. The scientific approach he took made it strong for me. He mentioned all the things that h "This book which attempts to bring together 30 years of research on how creative people live and work is an effort to make more understandable the mysterious process by which men and women come up with new ideas and new things." He mentioned all the things that he thinks you should have so it lead you to creativity. For example, mastery comes before creativity. Curiosity, love of subject, and etc.. Also, talked about the myth about creative people. For example: tortured soul, arrogant, and inborn skill. Moreover, happiness related to creativity. Great book about discovery and invention and creativity , it is too big and it went too long and was repetitive in some parts but generally I gained a lot of information from it about the life of creative people and how to more creative in my life. Hmm I don’t want to rate this book because after 5 years of not reading any Human Development books -which I’m against- I might find this book interesting at the beginning then ending up judging it as trivial few years later. Anyhow found some cool facts and motivating stories between the lines but the whole idea could have been plotted through half of the book. Wouldn’t deny that some chapters gave me a creativity boost and I may end up doing something after all. So, I’ve been very fond of Csikzentmihalyi’s work since Flow, and I think this book is the perfect sequel to an esoteric field of psychology. It provides much insight into the working minds of prolific persons within a particular field and/or domain, and breaks down the working order of insights that these people have and also provides a coherent order of hierarchy in how to be and become a creative individual. The last couple of chapters had me tugging for more. Great book. rambles. 15 hours of rambles. a couple good quotes. some interesting history snippets. still not sure what was meant by creativity as it was spelled out differently like 14 times. I feel like this book was "the random stuff I learned writing about flow that I wanted to put in a book so I made another book loosely about 'creativity'"
I'm most likely not creative enough to come up with a divergent perspective on the presented exploration of what constitutes creativity, but the point is to not give up in the face of difficulty. A motivation to read this book for students, soon-to-be parents, or just anyone with a minimal passion for self-improvement is to better understand the contributing factors to creativity and flow. We weten pas of een idee nieuw is als we daarvoor een richtlijn hebben, en we weten pas of het nieuwe nuttig is wanneer het door de samenleving getaxeerd is. 1. Mensen die uiting geven aan ongebruikelijke gedachten die interessant of inspirerend zijn. Deze mensen zijn mogelijk bijzonder intelligent, briljant. 2. Mensen die de wereld op nieuwe en oorspronkelijke wijzen ervaren. Verfrissende visie, belangrijke ontdekkingen. Deze mensen zijn persoonlijk cre We weten pas of een idee nieuw is als we daarvoor een richtlijn hebben, en we weten pas of het nieuwe nuttig is wanneer het door de samenleving getaxeerd is. 2. Mensen die de wereld op nieuwe en oorspronkelijke wijzen ervaren. Verfrissende visie, belangrijke ontdekkingen. Deze mensen zijn persoonlijk creatief. Creativiteit is subjectief van aard. 3. Mensen die belangrijke verschuivingen in de cultuur hebben teweeggebracht: Da Vinci, Edison, Picasso, Einstein. 2. Veld: alle mensen die fungeren als bewakers van het gebied. In het arbeidsveld wordt bepaald of iets nieuws wordt erkend, bewaard en herinnerd. 3. Individuele mens: degene die werkt met een gebied en daarover een nieuw inzicht of idee heeft, dat door het veld wordt geselecteerd om deel uit te maken van het gebied. De volgende generatie zal de vernieuwing zien als vast onderdeel van het gebied. Creativiteit = elke daad, idee of product dat het bestaand gebied verandert, of dat een bestaand gebied verandert in een nieuw. Creatieve mens = iemand wiens gedachten of handelingen een gebied veranderen of een nieuw gebied vestigen. - een gebied veranderen of vestigen kan niet zonder de expliciete of impliciete instemming van het veld dat daarvoor verantwoordelijk is. - creativiteit is dus niet talent of genie. - Creativiteit bestaat dus alleen in een formeel gebied. Bijv niet in huishouden, of tuinieren, of barhartigheid, omdat daar geen regels en geen arbeidsveld voor bestaat. Kennis die extrasomatisch (=niet via chemie en chromosomen) wordt doorgegeven, maakt gebruik van symbolen. Deze kennis en symbolen zijn gebundeld in gebieden: muziek, wiskunde, recht, religie etc. Het bestaan van deze gebieden bewijst dat wij patronen kunnen ervaren die de evolutie niet in onze genen programmeerde. Door de regels van een gebied te leren, overschrijden we de grenzen van biologische evolutie naar culturele evolutie. Meme = culturele informatie-eenheid; strijd tussen memes is als strijd tussen genen om voortbestaan. - Veel lichamelijke energie én stil en rustig. Afwisselend activiteit (wanneer het nodig is) met rust en bezinning (opladen) volgens interne behoefte. Tot op hoge leeftijd. Ook seksueel: combinatie sterke geslachtsdrift met spartaanse onthouding; drift voor vitaal leven en terughoudendheid om geen energie te verspillen. - Slim én naief. Convergent denken= goede antwoorden op afgebakende rationele vraagstukken, hoog iq. Divergent denken = nieuwe ideeën genereren, flexibiliteit, van standpunt kunnen wisselen, oorspronkelijkheid. Vermogen om onderscheid te maken tussen goede en slechte ideeën is weer convergent denken. - Speelsheid en discipline. Lichthartige houding voor nieuwe ideeën en discipline voor het harde werk dat nodig is om tot een goed einde te brengen. Vb beeldhouwen of schilderen. - Verbeelding en realiteitszin. Normale mensen zijn zelden oorspronkelijk, maar soms wel bizar; creatieve mensen blijken oorspronkelijk te zijn, maar geworteld in werkelijkheid, niet bizar. - Bescheiden en trots. Ook in ambitie én onbaatzuchtigheid: ambitie nodig om iets voor elkaar te krijgen, onbaatzuchtigheid omdat het niet alleen om eigenbelang gaat. - Mannelijk en vrouwelijk: dominant / hard én gevoelig. Psychologische androgynie, veel breder concept dan homoseksualiteit; iemands vermogen om tegelijk agressief en zorgzaam, gevoelig en hard, dominant en onderdanig te zijn zonder dat het geslacht daarbij een rol speelt. - Traditioneel / conservatief en opstandig. - Gedreven / betrokken en objectief / onpartijdig. - Openheid en gevoeligheid. Veel pijn, onzekerheden, angsten en genot. Divergent denken wordt door de meeste mensen gezien als afwijkend; daardoor gevoel eenzaamheid en onbegrepen. Gevoel van leegte en verlies wanneer hij niet kan werken, of bron van creativiteit opdroogt. Genieten van scheppingsproces. In de praktijk pauzes tussen fasen en herhalingen van fasen. - Tijd en energie vrij maken voor nieuwe materie. - Minder energie besteden aan zelfbescherming. Minder voorspelbare doelen nastreven; wereld om ons heen in ander meer creatief licht zien. - Ontginnen van onze nieuwsgierigheid en belangstelling. Entropie ook van toepassing op onze geest: wanneer we niets te doen hebben, vervallen onze gedachten in de meest voorspelbare toestand, nl willekeur en verwarring. Wanneer er geen externe kracht is die ons tot concentratie dwingt, gaat onze geest dwalen, soort mentale chaos: onprettige dingen denken, nare herinneringen, neerslachtigheid, zinloze activiteiten, afleiding zoeken, passief vermaak. - Kom je bed uit met een doel voor ogen, de dag is de moeite waard. - Als je iets goed doet, dan heb je er ook lol in. - Om lol te houden moet je het steeds complexer maken. - Sterk worden. Beschermen tegen afleiding, verleiding. - Leef volgens vaste patronen en ritmes om daaraan geen energie te verliezen. - Tijd voor bezinning en ontspanning. Andere activiteiten dan gebruikelijk, niet niets doen, mag best inspannend zijn. - Geef vorm aan je eigen ruimte. - Ken jezelf, wat je leuk en wat je vreselijk vindt. - Doe meer dingen die je leuk vindt, minder dingen die je vreselijk vindt. Verzetten tegen de sleur van het dagelijkse leven. - Vind een manier om emoties tot uiting te brengen. - Bekijk een probleem van zoveel mogelijk kanten. - Denk na over de gevolgen van een probleem. - Produceer zoveel mogelijk verschillende ideeën. If taken as a collection of anecdotes from interviews with well-recognized elderly 'creative' persons of western european descent who generally were somehow affected by World War II with interspersed observations, Creativity provides several interesting insights that one could incorporate into any practice that has some kind of public recognition as a discipline (i.e. western poetry, painting, music, science, not dinosaur fart impersonation or whatever): 1) The realization that your best ideas g If taken as a collection of anecdotes from interviews with well-recognized elderly 'creative' persons of western european descent who generally were somehow affected by World War II with interspersed observations, Creativity provides several interesting insights that one could incorporate into any practice that has some kind of public recognition as a discipline (i.e. western poetry, painting, music, science, not dinosaur fart impersonation or whatever): 1) The realization that your best ideas generally present themselves when you are doing something entirely different that allows your mind to wander freely (i.e. on a bus, going to sleep, taking a walk). 2) You do what you want. No, really. Do what you want. If you're doing something not because it's what you want to be doing, you are unlikely to do create something remarkable. 3) If you want to be a laser, you must remove all attention-diffusing obstructions, in particular toxic people and/or environments that will zap you of your energy. You need that energy to direct to your goal. 2) Mind-numbingly narrow range of creative domains for a mind-numbingly narrow chronological period. Because of the bizarre age restriction (which I can understand for limiting purposes to the scope of the study), nearly all of the mentioned interviews included some way in which WWII influenced the outcomes of the creative work. I think while some of the conclusions about attention/flow are perhaps universals when it comes to creativity, the scope and range of experiences described is at times disappointingly repetitive. – what’s the good of studying creativity? – too good to be true? – what shapes creative lives? – what changes with age? If you care at all about creativity (and you should), this book is at least worth flipping through. A lot of what I got from the book can be surmised from chapter titles and skimming through reading topic sentences. It often reads like something of a textbook--it's not a narrative, but draws upon interviews with hundreds of creative individuals (including nobel prize winners, CEOs, writers, poets, and more), offering insights based on trends and with copious excerpts fro Quite the intriguing read. A lot of what I got from the book can be surmised from chapter titles and skimming through reading topic sentences. It often reads like something of a textbook--it's not a narrative, but draws upon interviews with hundreds of creative individuals (including nobel prize winners, CEOs, writers, poets, and more), offering insights based on trends and with copious excerpts from the individuals themselves, some of which are very worthwhile. The money sections of the book are the earlier parts that discuss what most all creative people tend to have in common--my favorite was the apparent paradox of contrasting traits (e.g., childlike curiosity tempered by an ability to single-mindedly focus on a creative task), and the later parts of the book where Mihaly discusses ways to make one's own life more personally creative (to be distinguished from the big-C Creativity, which also requires one's creative works to be recognized by others and to, in some fashion, make a difference in one's given field). Though it took me a couple of chapters to get used to the author's tone, I have found the book to be very enjoyable. It provides a definition of creativity that I've never thought about before, that includes not only the creative person, but also the community/specialists whose recognition are needed for the creativity to be valid. The book is very well organized. I like how it breaks creativity and the factors involved in it down into subtopics and offers extensive analysis of each. The book tal Though it took me a couple of chapters to get used to the author's tone, I have found the book to be very enjoyable. It provides a definition of creativity that I've never thought about before, that includes not only the creative person, but also the community/specialists whose recognition are needed for the creativity to be valid. The book is very well organized. I like how it breaks creativity and the factors involved in it down into subtopics and offers extensive analysis of each. The book talks about creativity, creative people, and the creative process. I think each topic is given exactly as much attention as it needs, never too little or too much. I also really like how parts of the interviews with creative people within the text are used. It makes the ideas presented seem more credible and gives them more meaning somehow. There are also a lot of examples that make the presented ideas easy to understand. Rather than a how-to book, I find an exploration of what creativity is and how it comes about much more interesting. I think this book is essential for anyone who considers themselves creative. This is one of the classic books on creativity and it is worth reading, but is has some fundamental flaws. The bulk of the book is based on research into people whose creative contributions to their fields created paradigm shifts. In fact, Creativity with a capital c is defined for the purposes of the book as creating paradigm shifts. The stories of individual people and the analysis of what contributed to their success are fascinating if erudite. The final chapter makes a claim that creativity This is one of the classic books on creativity and it is worth reading, but is has some fundamental flaws. The bulk of the book is based on research into people whose creative contributions to their fields created paradigm shifts. In fact, Creativity with a capital c is defined for the purposes of the book as creating paradigm shifts. The stories of individual people and the analysis of what contributed to their success are fascinating if erudite. In this brilliant book summarizing over 30 years of research into the psychology, habits, and reflections of distinguished and creative people from multiple domains, Professor Csikszentmihalyi distills the critical insights for a general reader. There are many pearls of wisdom. “To achieve creativity in an existing domain, there must be surplus attention available.” (8) “Centers of creativity tend to be at the intersection of different cultures, where beliefs, lifestyles, and knowledge mingle an In this brilliant book summarizing over 30 years of research into the psychology, habits, and reflections of distinguished and creative people from multiple domains, Professor Csikszentmihalyi distills the critical insights for a general reader. There are many pearls of wisdom. “To achieve creativity in an existing domain, there must be surplus attention available.” (8) “Centers of creativity tend to be at the intersection of different cultures, where beliefs, lifestyles, and knowledge mingle and allow individuals to see new combinations of ideas with greater ease.” (9) These statements are both simple and unsurprising, but also profound. 3. There is a balance between challenges and skills. Near the end of the book, Csikszentmihalyi provides a series of lists of advice. Each has an explanation, but here are the bare bones. Advice for the cultivation of curiosity and interest. •	Try to be surprised by something every day. •	Try to surprise at least one person every day. •	Write down each day what surprised you and how you surprised others. •	Wake up in the morning with a specific goal to look forward to. •	If you do anything well, it becomes enjoyable. •	Take charge of your schedule. •	Make time for reflection and relaxation. •	Find out what you like and what you hate about life. •	Start doing more of what you love, less of what you hate. This is a thoughtful read, incredibly well researched, and worth everyone’s time. Creativity may seem an elusive concept, but as a process it can be broken down into certain steps. Creativity usually happens in a system that contains a domain, a field and a person. Creative people pull inspiration from life; they work in a “flow” state and even stay creative far into old age. Importantly, the survival of the human race depends on creativity, so we as a society need to encourage its development. So work to cultivate creativity every day! I enjoyed this book enormously. I would easily recommend this book to any person who is either creative or just intrigued by the arts. Why? Because it reminds us all that the possibility of happiness is a mindful challenge. The book delves into the domain of the creative process. A work of wonder! He is noted for both his work in the study of happiness and creativity and also for his notoriously difficult name, i A Hungarian psychology professor, who emigrated to the United States at the age of 22. Now at Claremont Graduate University, he is the former head of the department of psychology at the University of Chicago and of the department of sociology and anthropology at Lake Forest College.